a creative, satisfying, peaceful and fun 2019. "Mixed Dozen" Grand Opening Saturday October 13 at 6 pm - all welcome! 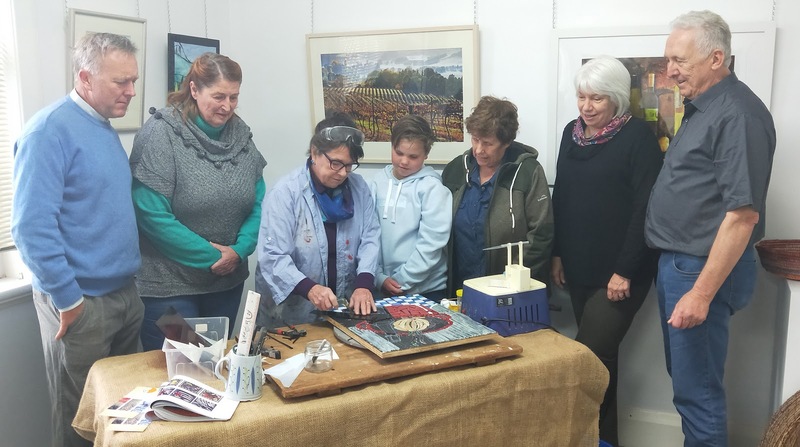 The artists of Colour City Creatives, (CCC), will once again be exhibiting their latest works in connection with the 2018 Orange Wine Week Festival. 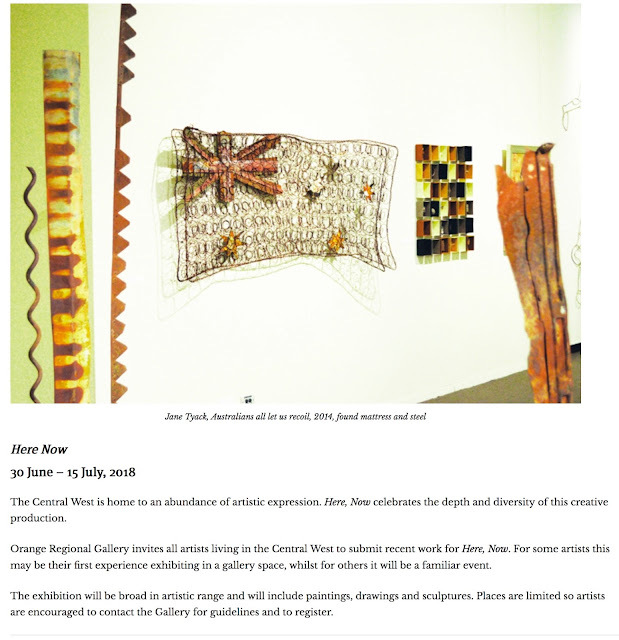 Included in this year's exhibition, titled “The Mixed Dozen”, will be a demonstration by Fayah McKenzie of her mosaic techniques. 11 AM t- 11 PM. Fayah as well as a lover of mosaic's and all types of artistic representations is also a member of the painting groups The Wild Women of Arkaroola, and the Wilderist inc tried. Cargo Road Wines once again gives their support to CCC Artists! 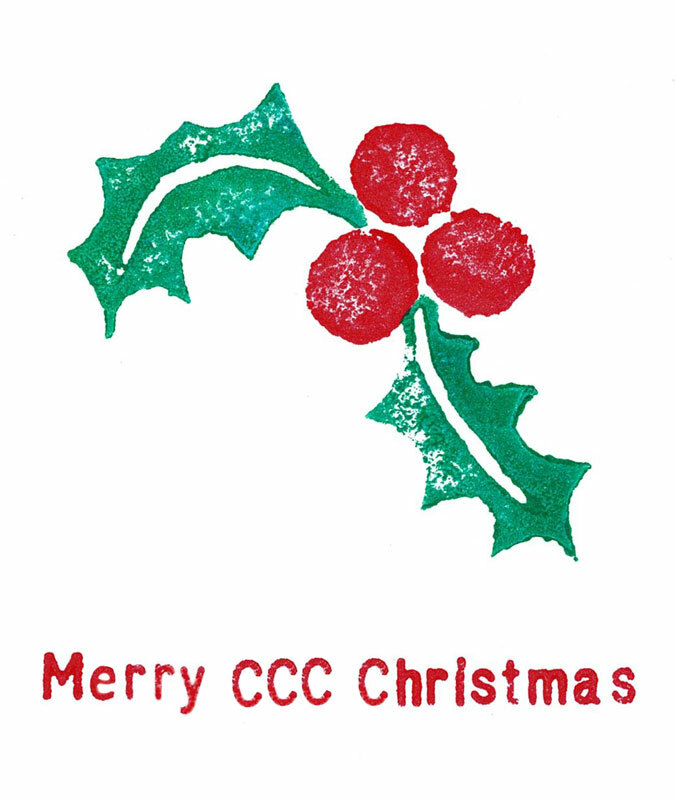 Helping CCC kick off this year's Mixed Dozen exhibition will be long time CCC supporter, owner of one of the region's oldest vineyards, James Sweetapple of Cargo Road Winery. “The Wine Week Festival is a great opportunity for locals and visitors to experience three of the Orange region's best offerings; its wines, food and its arts,” James said. 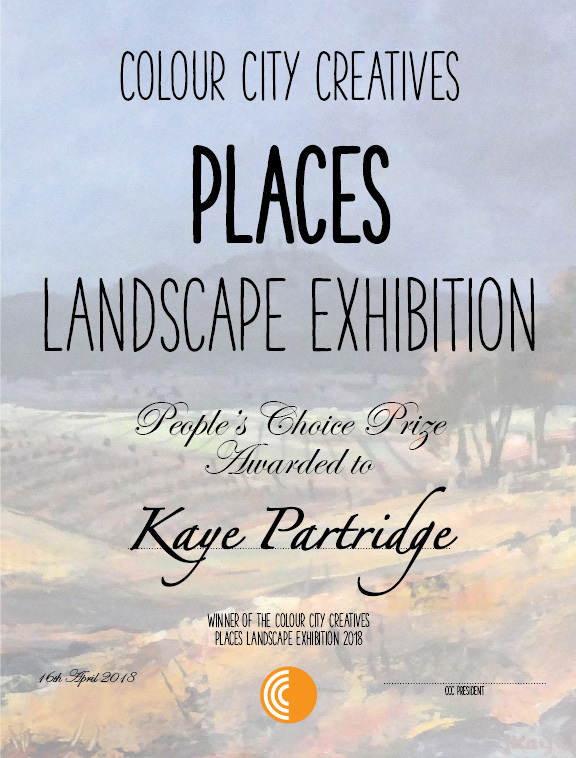 James continued, “The Colour City Creatives since their conception in 2009 has grown to become a welcomed cultural fixture on the Orange region's art scene, offering artists studio space, exhibition opportunities and support. “This holistic approach in support of the arts helps not only artists but expands the structure of the Orange community as a whole. This year the group will be presenting their latests works in an exhibiting a wide range of works appropriately titled. The Mixed Dozen,” James concluded. 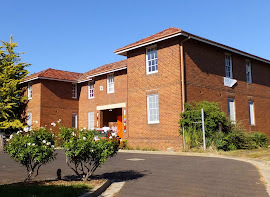 2b Peisley Street, Orange NSW. Studios and galleries will be open on the two weekends starting on Saturday October 13-14 through October 20-21 from 10 AM to 4 PM. The official opening will be held Saturday October 13 from 6 PM, all are welcomed. Gates will also be open during the week from 10 AM until 4 PM. Colour City Creatives Inc. (or CCC) Vision is to be an inspirational and inclusive arts organisation connected to and serving the local community through the provision of affordable studio spaces, exhibition opportunities and artistic support for Orange area artists. The group was founded in 2009. 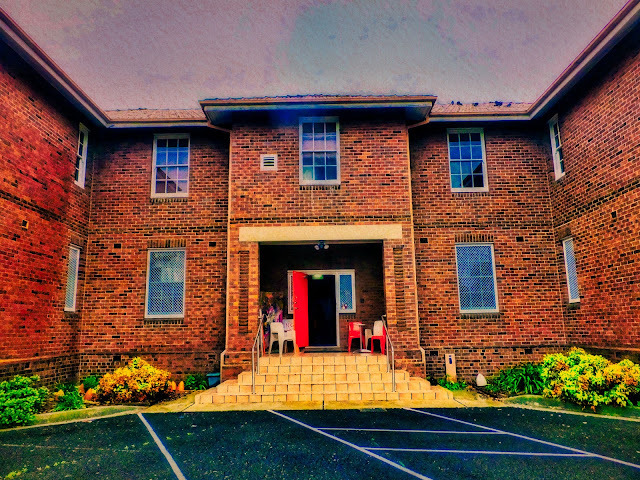 Colour City Creatives is based in the 'Barracks', previously the sleeping quarters for the area's railway workers. Presently the group is supported by 32 artists. Colour City Creative is graced with several talent immigrants, one of whom is the ever smiling Lanny Mackenzie. Lanny grew up in Java and Bali Indonesia. She was surrounded from a young age by the art of her father’s impressionist paintings and her grand father’s Chinese Calligraphy. With vibrant colours blazing from her family's walls she took up, in 2002, the task of learning basketry and sculptural weaving. Using naturally forage materials and recycled every day items, Lanny's works create functional baskets, weaving with her own experimental twists producing a modern 'look'. Over the years Lanny learned her craft under the toutalage of several master weavers. She now willingly shares this passion and knowledge with others through her popular weaving workshops, all over Australia and overseas. Lanny says “Weaving is a very forgiving form of art, cultivating creative thinking and problem solving, and encourage individual self-expression resulting in satisfaction in creating something unique and part of own personal journey and culture”. 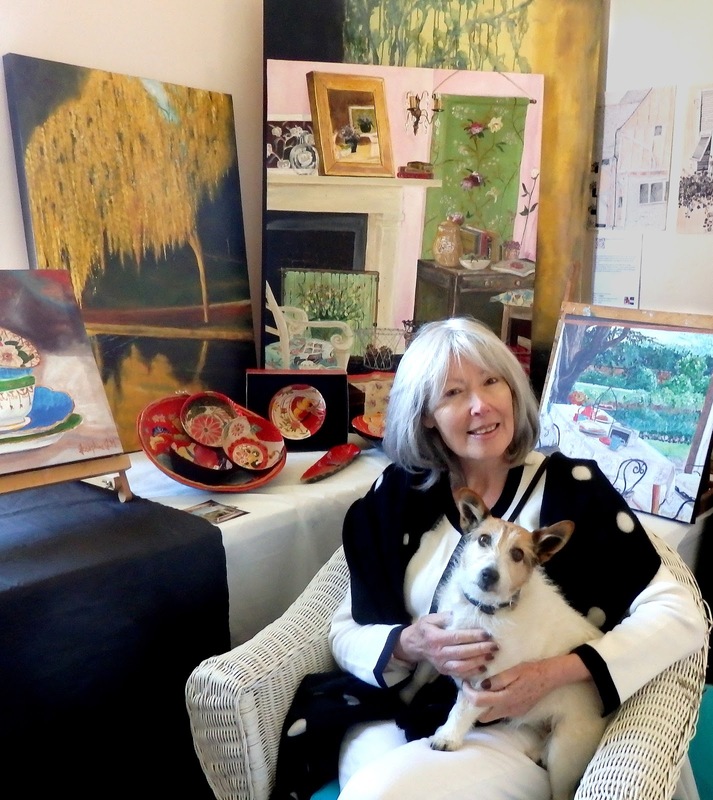 Lanny's creations are in private collections and selected galleries in NSW and Bali. from 10 AM until 4 PM. There will be a grand opening on Saturday the 13th of October from 6 PM. 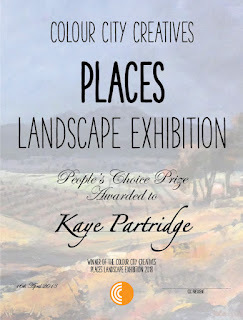 For more information regarding this and future events please visit us on www.colourcitycreatives.com or on Facebook at www.facebook.com/colourcitycreatives. 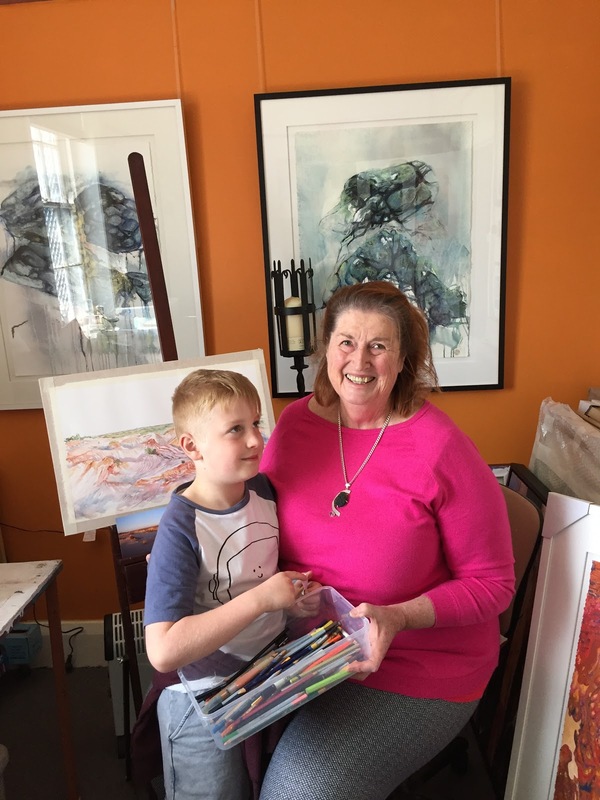 While Joy Engelman prepares her latest works for Colour City Creatives, “The Mixed Dozen” Wine Week exhibition, she has her grandson Oscar Engelman next to her for support. “Oscar often sits and paints with me which delights my old artist soul. I love having him watching what I do while I try to help him develop his own visions,” Joy said. Joy also shares with another group named, “The Wilderists”. As the name suggest this group travels widely through the outback seeking inspiration. Currently the group is exhibiting at Grenfell Art Gallery in "The Call of the Wild" until 14 October. located at 2b Peisley Street, Orange NSW. Gates will also be open during the week from 10 AM until 4 PM. We're open again for the Wine Festival! in Orange, New South Wales. so don't be shy, come along and see how it's all created! Our Barracks building is getting an early spring clean of vegetation that for over 70 years has been creeping ever closer and higher. We have part of our new signage done and the visibility of our building will allow the signage to be seen too. It's a bonus round to us as the tree and bush trimming not only gives us visibility but also the visibility gives us greater security. Though it looks a little brutal at the moment, when spring comes the trees and bushes will cover the bare branches with gorgeous green growth. Our AGM is done and dusted. Not the highest attendance but certainly one of the most participatory and lively gatherings. Our new committee has been elected and we will see some great changes and goals set by the new team. They will bring a renewed energy and new ideas that will make our group even better. Philip Salmon has agreed to be our president for another year and that is very good as his vision has led our varied bunch to great achievements. It is also good because it gives some continuity to the new group. His latest coup was to purchase a full compliment of framing equipment which will be set up in the Loco building and save our members a ton of money in framing costs. Watch this space for more good news through the year. Put your funny hat on, have your understanding of social commentary nearby and don't forget that pinch of salt! So proud of those two fish heads or is that flatheads? Some time ago the moving picture industry started to include in the final credits all the people and organisations involved in the making of the movie or film. We got talking one day and thought we should do a video with 30 seconds of story and 2 minutes of credits. The story was to be about dog's best friend, but poor Mindi had reached 90 years in human time, was blind in one eye and in pain so was taken to the vet. A substitute was required, hence the bird. Some viewers may regard this video as shithouse, but it is our first "outhouse"
If you haven't already there's still time to take part in 2 great local exhibitions. Orange Regional Gallery has had a call out to local artists to take part in a show called Here, Now 30 June - 15 July 2018. We're getting ready to book our Orange Wine Festival entry, which will start Friday 12 October and end Sunday 21 October 2018. So get your creative caps on and get the tools of your imagination out. Your committee after 2 years of organising the themed events has settled on using names for the exhibitions that most fit the festivals. 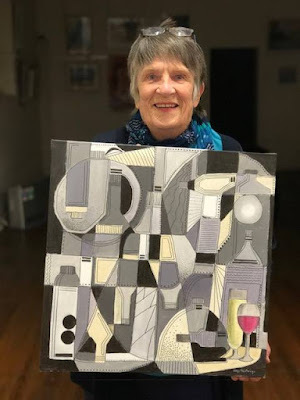 Wine Festival will now always be called "Mixed Dozen", Banjo Festival themed exhibition is "Poem to Painting" and FOOD Festival's name and theme will be "Palate to Palette". The creative road can be long and the idea is to give you all time to think, gestate and create at your pace and exhibit the fabulous art our visitors so love. The "Mixed Dozen" exhibition art is to be inspired by all things wine: makers, landscape, product and even the byproduct of wine. A broad definition that gives you a chance to sharpen your focus on what most resonates in your creative soul. Kaye Partridge with her fabulous painting "There's A Strawberry Patch In There Somewhere!" 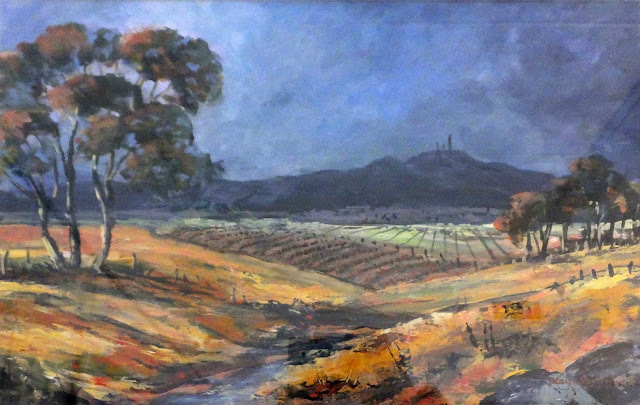 During the 1970’s and 80’s, my family lived on a small acreage at Borenore in plain sight of Mt Canobolas. It was an escape to the country and we played at doing the ‘subsistence thing’ which was only partially successful, but we did have a winner with strawberries. After planting 3,000 plants, we sat back and waited for the dollars to come rolling in. Nobody warned us that strawberries tended to ripen all at once, so there were times when life became quite frantic. But it was all a great experience and fondly reminisce - and we still haven’t ever found commercial strawberries that tasted so good as ours! Jenny Davidson mentioned a quote to me that beautifully describes what we try to do as artists. “Painting is poetry that is seen rather than felt, and poetry is painting that is felt rather than seen.” words attributed to Leonardo da Vinci. With the Banjo Paterson Poetry Festival being one of our tri-annual exhibition opportunities, the da Vinci quote seemes particularly apt. Although not as big a festival as FOOD or Wine, our doors saw a lot of happy faces come and go. 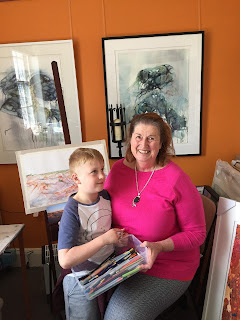 Some bought art, some bought from our shop, some strolled and pondered but all were happy to have glimpsed not only great contemporary art but also being able to walk into an artist's studio and see the sanctum of creativity. Every one of our visitors voted on the work in the Gore gallery and from the count, one was a clear favourite. 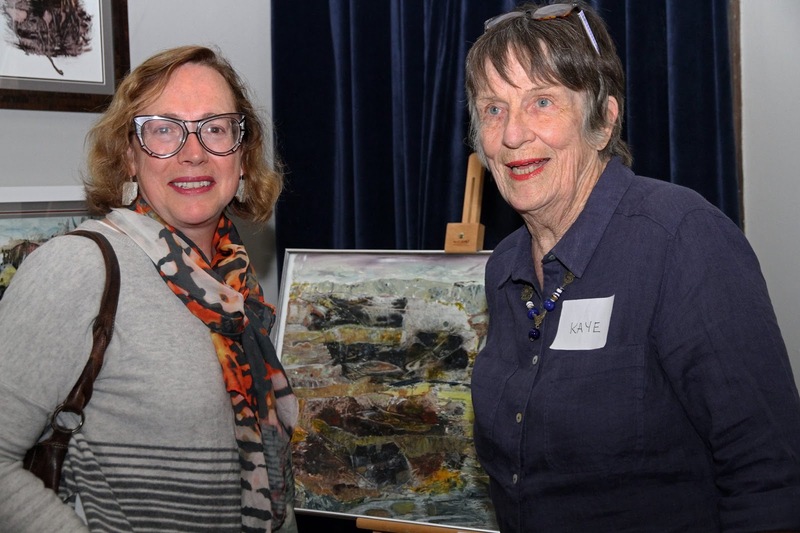 The winner of the Poems To Paintings exhibition held in the Gore gallery during our Banjo Paterson Poetry Festival! 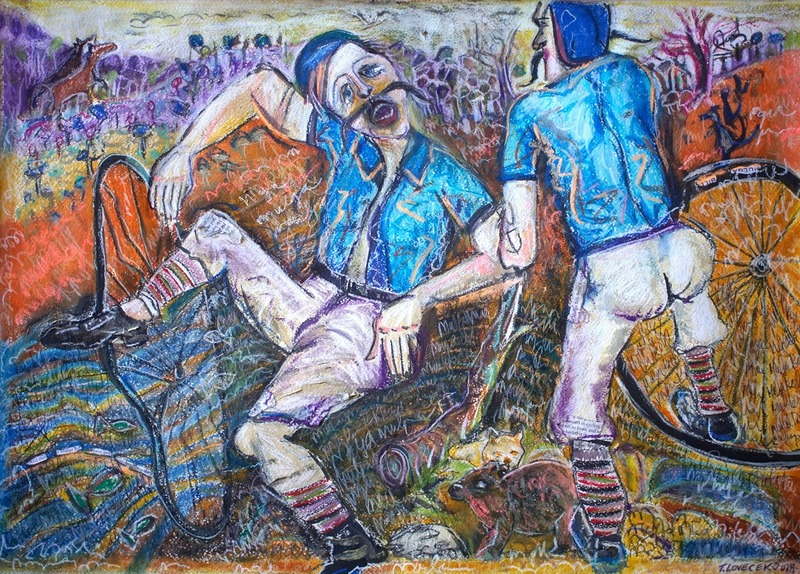 Was won by a wide margin with Patricia Lovecek's work titled "Mulga Bill", a fun interpretative rendition of the essence of the poem "Mulga Bill's Bicycle". Our Dinning Chairs.... oh the shame and the recovery!